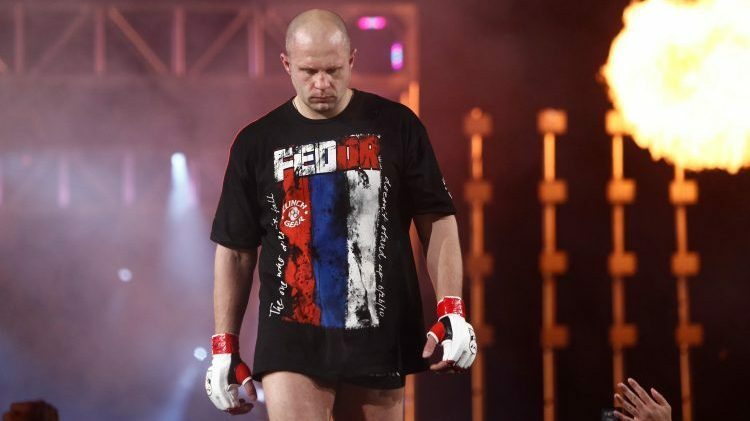 His Pride Fighting Championships heyday has drifted into legend, but Fedor Emelianenko still moves the needle. Emelianenko will square off with Chael Sonnen in the Bellator MMA heavyweight grand prix semifinals at Bellator 208 on Saturday at Nassau Veterans Memorial Coliseum in Uniondale, New York. The 42-year-old Russian icon has won six of his last seven bouts and enters the match on the heels of his technical knockout against Frank Mir in the tournament quarterfinals. Emelianenko has delivered 28 of his 37 career victories by knockout, technical knockout, or submission; a staggering 25 of them have occurred inside the first round, including 12-, 26-, 36-, 48-, 54-, 62-, 63- and 69-second finishes. “The Last Emperor” enjoys almost universal reverence among seasoned mixed martial arts observers, many of whom still rank him as the greatest fighter of all-time. 1. While he has his detractors, the track record speaks for itself. Whenever “The Last Emperor” decides to hang up the gloves for good, he will do so with one of the sport’s most impressive resumes. He has defeated five former Ultimate Fighting Championship titleholders (Mir, Andrei Arlovski, Tim Sylvia, Mark Coleman and Kevin Randleman), three K-1 World Grand Prix winners (Mark Hunt, Mirko Filipovic and Semmy Schilt), two Olympic silver medalists (Matt Lindland and Naoya Ogawa), an Olympic gold medalist (Satoshi Ishii), and a former Pride champion (Antonio Rodrigo Nogueira). Emelianenko’s list of vanquished opponents also includes Pedro Rizzo, Jeff Monson, Heath Herring, Renato Sobral and Ricardo Arona. 2. He put together a historic run of dominance in his prime. From April 6, 2001, until Nov. 7, 2009, Emelianenko compiled a ridiculous 27-0 record with one no-contest across 28 appearances. He went 3,473 days between losses. 3. Few mixed martial artists have stayed at the top longer. On March 16, 2003, Emelianenko waged a memorable battle against Nogueira in the Pride 25 main event at Yokohama Arena in Yokohama, Japan. He took a three-round unanimous decision from “Minotauro” and assumed his position on the heavyweight throne. Emelianenko remained champion until Pride shuttered its doors in 2007, finishing a perfect 14-0 with the Japan-based organization. Only Jose Aldo, Wanderlei Silva, Georges St. Pierre and Anderson Silva have enjoyed longer reigns as major MMA champions than Emelianenko, who held the Pride title for 1,663 days. 4. Judges appreciate his work. “The Last Emperor” has never lost a decision and in fact owns a perfect 9-0 record in bouts that have gone the distance. Those wins have come against Maldonado, Monson, Filipovic, Nogueira (twice), Schilt, Sobral, Arona, and Ryushi Yanagisawa. 5. Prompting tapouts has always been a specialty. Emelianenko has 15 submission victories to his credit: six by armbar, four by rear-naked choke, three by kimura and two by guillotine choke. He has also struck two opponents — Wagner da Conceicao Martins and Jaideep Singh — into submission.